The birth of a baby boy or girl is always a joyous occasion, not just for the parents, but also for their friends and family, who share in their happiness. The first occasion to celebrate the newborn is their christening, a ceremony which is often a day spent with loved ones in celebration of the baby’s birth. Everyone who’s invited to the baptism usually brings a gift for the baby girl or boy who is receiving the sacrament: have you been invited to an event like this and you’re looking for the right gift to give? We’ve created a jewellery selection for you that’s perfect for the baby being baptised. The stork has delivered a baby girl and you need a gift idea for her christening? Among our selection you’ll find many jewellery options perfect for a baby but which she can also wear as she gets older, a keepsake of important moments spent with her family. The most original baptism gift for a girl? A bracelet customised just for her! With our precious Composable Links you can create a one-of-a-kind bracelet made especially for this baby girl. The Links which are perfect for a christening gift include symbols in gold and sparkling gemstones dedicated to the zodiac signs, beautiful coloured gemstones in a heart shape, good luck symbols and adorable coloured animals. Looking for an important gift for your granddaughter’s or niece’s baptism? Choose one of the pre-made Composable bracelets as the perfect reminder of this occasion, or a necklace with a coloured gemstone pendant. Discover our selection of jewellery that’s the perfect christening gift for a baby girl! And for him? How do you choose a christening gift for a baby boy? There’s a wonderful selection of precious Composable Links dedicated to boys you can use to create a customised bracelet that’s perfect for him. There are tons of Links decorated with symbols for kids: coloured baby feet and shoes, teddy bears, and pacifiers, all crafted in gold and painted with light blue enamel, the perfect gift for a boy’s baptism. Are there actually two babies being baptised, because the stork has delivered a set of twins? 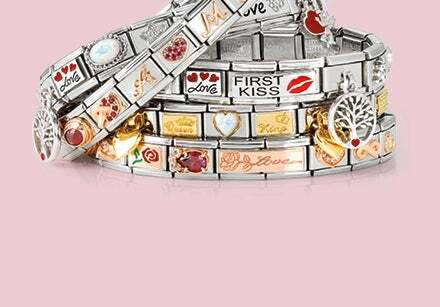 Dedicate identical or very similar bracelets to the both of them for a christening gift they can wear forever, as a keepsake of their brotherly bond and the special relationship they have with the person who gave them this precious gift. There are many jewellery options to choose from for a baby boy’s baptism gift: gold, coloured enamel and gemstones decorate the charms which can be worn by the baby boy today, and also tomorrow. The godmother and godfather are important figures in a child’s life, chosen for their christening as two people the child and parents can trust and always count on. In many countries it’s now customary for the christened baby’s parents to give a special gift to the godmother and godfather. Not the classic party favour, but a personal gift, one that’s original and which gives a proper thanks to this important figure in the child’s life. One idea? For the godmother and godfather, a nice gift is to compose a customised bracelet which reminds them of their special bond with the baptised baby boy or girl. 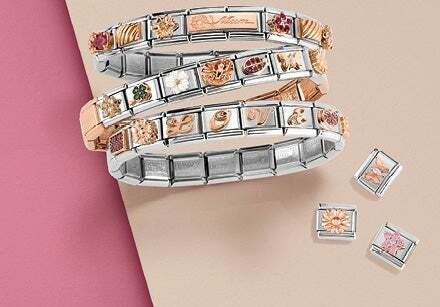 Discover all the precious Links perfect for them!